This is second part of the transcript of a talk delivered by late Prof. Kasturi many years ago. The first part appeared in November issue. This is being brought to you from our archives and we regret that we do not have the exact date of this talk, but we can say with reasonable surety that it was in the year 1987. “I move all around the cosmos. I am found everywhere.” And that is why we have stories how Baba is all over the world. One method of Baba showing His presence in any place is - what you call ‘signs and wonders’ - of Vibhuti or any other thing falling from His pictures; not only His pictures but other pictures too. Whatever name you call Him, Jesus Christ it may be, or it may be Rama, Krishna or whatever it is, it doesn’t make any distinction. And in order to show that it doesn’t make any distinction, you get this vibhuti or a number of articles falling from His pictures - a thing that has never been recorded of any Divine phenomenon so far in human history. I have got with me photographs of pictures in a shrine in Perth, Australia; three photographs that this lady sent me. In one, you’ve got kumkum (vermillion) in the shape of a big Om. Baba is standing and there is a big Om encircling His frame. And in another, you’ve got yellow around His head; and in the third, a Shiva picture - they got in pink! They call it ‘pink vibhuti’ all over the head arranged in a beautiful form! He is found everywhere. His presence is felt. He appears in dreams; He moves about. People have actually seen Him and been touched by Him. He is a great Phenomenon. For those of you who are in Bangalore, when you go next, to go to Mysore, I would advise you to go to a place near the second bridge of Kaveri - the bridge nearer to Mysore - there you have a shrine of Baba and a great phenomenon is happening there for the last eight years. There’s a man there who was a labourer, a wage earner, in a sugar factory. He had come to Mysore and he purchased a ring that was eight annas (paise) worth; and it had an enamel portrait of Baba which fell off. And later he kept it in a container and you get from that container - from that enamel portrait - something sweet, fragrant and sticky; something like honey which we call amrita - a strange fragrance, a strange taste. And it has been oozing out of that enamel portrait for the last eight years, night and day! At least three quarters of a litre every day! And when he puts it on your palm, you can see the trickle - gradually the nectar coming, trickling and falling. Richard Bock of America, has taken a film of that years ago, and it is still happening. The signs of His presence are all over the world. There is no place which is too far for Him. There is one Norwegian, Tidemann, a marine engineer who has got a few patents. The grain ships when they come, they have to take out the grain by some vacuum arrangement or some such thing, by pipelines. He has got patents of such contraptions. And he was in Bombay for many years and used to go to Shirdi with some Parsi friends. He found that Shirdi Sai Baba had taken avatar again. So he came to Baba and used to visit off and on. When Pakistan bombed the harbors of East Pakistan, Chittagong had to be repaired. And this marine engineer got a contract and before going there he came to Puttaparthi, and Baba gave him a ring. Sometimes we say, “I will give you a ring, I promise” and what we do is we call them over the phone! Baba actually gave him a ring, but some people say, “No Swami, I don’t wear a ring usually, no jewelry, etc.” But Baba says, “No! It is not for you! It is for Me that I am giving! So that I may have some contact with you; so I may know what happens to you!” So it is a kind of a contact that He wants to keep with the people whom He wants to Grace. So this chap also said: “No, no ring for me, Swami.” But Baba said: “No, it is for My sake” and He gave him a ring. Baba just waved His Hand and there was a ring. Of course everyone was tempted to ask: “Is it the same ring?” That question came right up to my throat also but it was Dr. Bhagavantham who asked. He said: “Is that the same thing?” Of course his was a scientific curiosity. 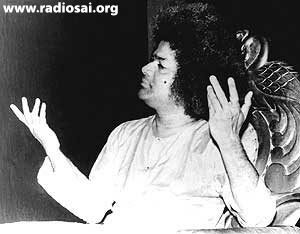 Swami turned to him and said: “After having experienced me all these years you are still doubting?” He got it. I would have got it too if I had come out with that question. Luckily I had swallowed that question! Swami said, “It fell into my hands. I was in that river.” Now this is: “I move; I am everywhere.” Tidemann’s ring fell into Chittagong River on a certain January 20th or so, and he came in February. You can’t believe how all this is possible! Of course, Tidemann came and did namaskaar, and before He gave it to him, He said: “Look here! I have told you not to do certain things when you are in Bangladesh. And you are doing it! Now promise that you won’t do it again.” Then he promised and shed some tears. Then, He gave it to him and cautioned him again. So He is everywhere. Or, let me give you one more instance. At the government hospital in Guwahati, Assam, a matron lived inside the hospital premises. And she was a devotee of Baba. She had His pictures all over the place. I have been to their house; they have one in the kitchen, one in the drawing room, one in the sitting room, one in the shrine room, one on the table, and one right in front of the entrance door - 16 big pictures of Baba - and also other Gods and Divinities. She was having bhajans in her house. Her sister, a young girl of 13 who was going to school, one day found a cat caught in the rain and brought that little creature home. Her sister had an allergy for cats - something like Lord Kitchener who had an allergy for cats, it seems, he could fight a battle but not with a cat. Yes! She did that. And the cat was beaten. And as the cat was being beaten, all the pictures of Baba on the walls fell down - kitchen, dining room, drawing room, and table. They thought it was an earthquake; because in Assam there are frequent earthquakes. And all the guests ran out on the road. But she found that only Baba’s picture fell. The sister said, “Stop killing that cat!” And then, placed the cat on the table. The cat shook her body because it was suffering terribly from pain. And all over the table fell vibhuti that had been applied to the cat by some unseen hand. Vibhuti! On the cat! That’s God! I marked that particular girl and when she came out, I asked: “Who is this cat to whom He is giving vibhuti?” And then she told me the whole story: “There’s a cat blessed by Him; He had put vibhuti on her.” Then I went to the place and got a photograph of the cat and I fondled that cat because it is such a blessed cat that Baba has put vibhuti on the cat. Call Him and He answers. Even a cat! After my retirement, which happened years ago, I went to Benares. Baba said, “You go on a pilgrimage. Your mother is very anxious. You take her on a spiritual journey to holy places.” So I, my wife and my mother, went to Him and wanted His blessings for the journey. And then He said, “Four people are journeying, purchase three tickets”. So we were four passengers with three tickets. He is the stowaway in all planes and streamers and really a ticketless passenger all through. 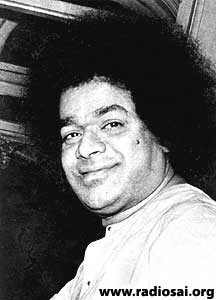 At times, some people ask Him, “Swami, give me leave, I want to go to Hyderabad or some other place.” He’ll say, “Why do you ask leave of somebody who is coming with you?” He is coming with us, He is always with us. 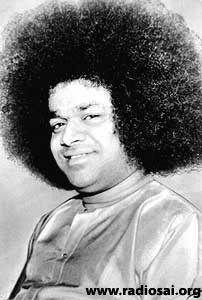 The daughter of Dr. Chandru, a dentist in Malaysia, had to go to Vancouver and he asked Swami’s blessings saying, “I am sending my daughter to Vancouver.” Swami said, “Alright, why are you worrying? I will take her to Vancouver.” And she writes from there that in all the planes which she got into on her way to Vancouver , the left seat was vacant! So He is that ticketless passenger who occupies a seat always. 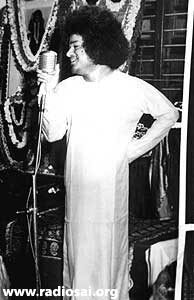 He said, “All right”, just for good manners and put it in his pocket, and then thought, “What shall I do with it?’ And when Bala Krishna told him to put it into his mouth, he was shocked even more! Eating ash is not a very pleasant thing to do. He said, “Whenever you encounter any difficulty which you cannot overcome by yourself, put a little in your mouth and pray to Baba.” He gave him a photograph too. It is absolutely unbelievable what happened later. He went home. He had to go to New York and he writes a letter from London airport. “I got into a jumbo jet in Delhi and I got the last seat, and I was surrounded by women.” Of course that’s not a calamity for many people but he didn’t quite welcome it – quite a misanthrope, I believe! He says there were women and children; probably it was the nuisance these children created. 14 hours he had to travel surrounded by women and children. And I think that many of these children must have got up on his shoulder and taken his glasses out and tried to find out whether his nose was fixed on his face nicely. He felt absolutely miserable and he wanted to change his seat. He says, “I got down at the London airport. As I was walking around the airport, I remembered the powder which he had given me. And I wanted to test its efficacy.” And he put a little in his own mouth and thought of the picture that he had got. He writes, “Immediately, my name was called over the loud speaker. I was asked to go to the query office. I was informed that I was to continue the journey in the first class! I was ushered into the first class. And when I offered to pay the extra, they said it had been paid!” The extra amount had been paid! And therefore the next sentence is justifiable. The next sentence is: “That powder is some powerful stuff!” And that Patterson came again! Of course, how could he keep back after this experience? So he came here. I said, “You are Patterson? I have been talking about you all over the country and I am glad I saw you now.” And he had to leave early morning. Baba was interviewing some others. So I said, “Are you waiting to see Baba?” He said, “No, I don’t want to bother Him. For one and a half hours I was sitting in the front line today. Baba was standing right in front of me. He was speaking in Telegu; but that doesn’t matter. I heard His voice; I listened to Him singing bhajans, two of them! I could see Him; fill my eyes with Him for one and a half hours! That is enough. I am going.” That is Patterson. London airport gets upset on account of this man putting a little vibhuti in his mouth! That is the kind of power that this Phenomenon is. Dr. John Hislop said that he once bought a house overlooking the Pacific Ocean. Then they found the hill was seeping; it wasn’t geologically a safe place. So the houses were getting down and one of the houses had, in fact, collapsed and gone into the waves. And the geologists of Mexico came and measured with a tape and said, “This month it has come three cms, four cms, etc.” So it was inevitable that his house must go in the Pacific Ocean. And they didn’t know what to do. So Hislop put up a big photograph of Baba facing the Pacific Ocean and prayed, “Stop the waves! Stop this hill from sliding!” And he said the geologists were not able to discover any further sliding of the house down the hill. For devotees who are dedicated to Him, He will stop the earth from sliding or the sea from inviting houses into itself! Now, the third line of the poem is very important. 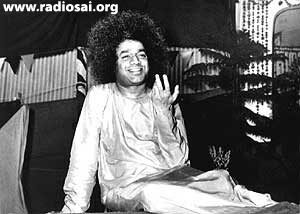 Hitherto what we have read of incarnations is that God says,” I will protect and guard the devotees.” But Baba says, “I will give devotion and save.” All of us have come because He has given devotion to us. He has caught hold of us and given us love for Him. He has put us on the right path and trained us. Dear Reader, did you find this article helpful? Have you seen Prof. Kasturi in person? Do you have any interesting memories concerning him that you would like to share? Please write to us at [email protected] mentioning your name and country. Thank you for your time.